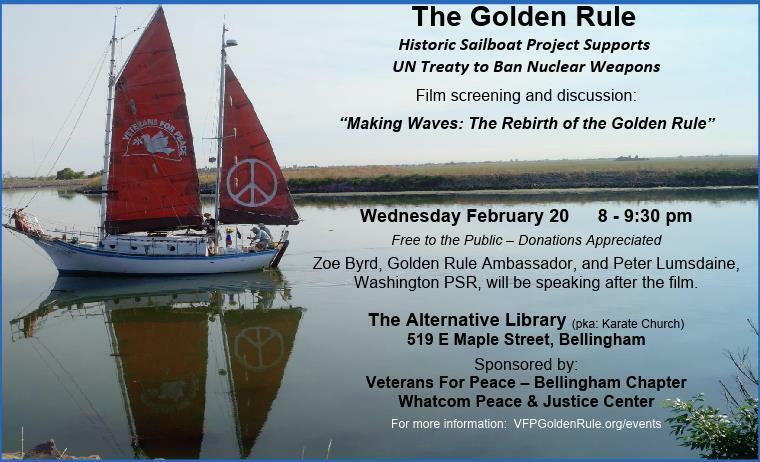 This 25-minute documentary covers the history of the Golden Rule, a historic anti-nuclear peace boat, from her first voyage in 1958 through restoration from 2010 to 2015 and her current voyages. It focuses on Veterans For Peace’s work with their re-built sailing boat, the first boat on which people challenged nuclear bomb tests in the Pacific years ago, and which will be sailing to Micronesia and Hiroshima next year. The film won best short documentary at the Guam International Film Festival. Filmmaker James “Seamus” Knight of Caneyhead Productions produced the film during the San Diego Fleet Week protest on October 14, 2017 in conjunction with Veterans For Peace, San Diego chapter. After the screening, Zoe Byrd, VFP Golden Rule Project ambassador, and Peter Lumsdaine, Washington Physicians for Social Responsibility, will speak.